Free condoms for everyone! At least that is the goal set forth by a new initiative that launched on Feb. 14 called Free Condoms Memphis. 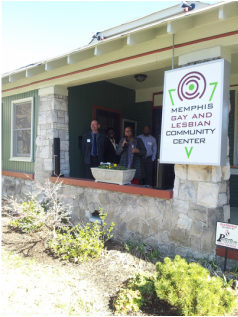 A press conference announcing the new program was held at the Memphis Gay and Lesbian Community Center located at 892 South Cooper St. in Cooper Young. Free Condoms Memphis has been a dream come true for Elokin CaPece, director of education at Memphis Planned Parenthood. CaPece has been involved with HIV testing since 2007 and educates HIV testers. The condoms are being distributed at no cost with no questions asked at 30 different locations around the Memphis area. The condoms are donated to the program through distributors and social outreach programs. The diversity of locations ranges from places like Memphis and Shelby County Health Department, a laundromat, a barber shop and churches. The diversity of availability in where people may obtain condoms through Free Condoms Memphis is also something that is of particular importance to Young. “It’s not just the usual suspects of non-profits that are doing this type of work. You have business leaders, you have church leaders, you have different people that have invested energy and they are committed to seeing people healthier here,” Young said. Businesses have gotten involved with the program as a way to be a place where people don’t feel pressure about the issues and obtaining condoms. People are also allowed to take as many condoms as they think they might need through this initiative. Free Condoms Memphis now has advertisements on buses throughout the city to let people know about the program and all locations are equipped with supplies. You can learn more about the initiative and a location near you at FreeCondomsMemphis.org.